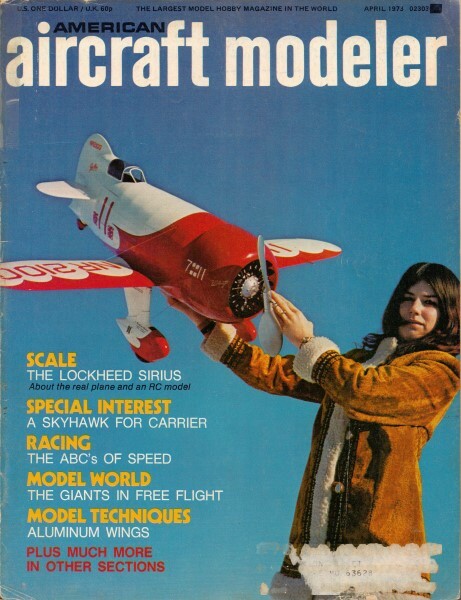 Here is the article and plans for the Lockheed Sirius that I electronically scanned from my purchased copy of the April 1973 American Aircraft Modeler magazine. You might be able to scale up the image below if you cannot find suitable plans for sale. Plans for this fine model were drawn by Mr. Maurice F. Philips. All copyrights (if any) are hereby acknowledged. There were actually two separate articles, one that covered the history of the Lockheed Sirius, written by Patricia T. Groves, and the other this construction article for a scale R/C version. Well-detailed and perfect scale RC version of the Lindbergh inspired Lockheed design uses foam wings and a glass fuselage. A docile flyer, too. The search for a suitable model to scale and to construct gets more difficult as modelers continually dig through the files of civilian and military aircraft. It was surprising to find that the Sirius hasn't recently been built. Many older modelers remember the famous plane that Lindbergh used to map out some of Pan Am's early airways. Admiration for the model of this grand old aircraft of the golden era was expressed by many of the spectators at the '72 Chicago Nats. Several mentioned that the model flew just like the full-sized plane they had seen fly in the 30s. It was pleasantly surprising to find spectator appeal so high. There were two friends that influenced my decision to build the Lockheed Sirius - Monty Groves and Bob Palmer. Both, although separated geographically, have a common interest in Lockheed aircraft. The Sirius model results from the combined unique talents of the three of us. Monty and his wife Patty have researched Lockheed aircraft for years and has a large file of photographs and technical data to support their docu­mentation. Bob Palmer, a professional modeler, has produced several fiberglass fuselage kits of very high quality. This airplane was a natural for him due to his ability to reproduce the scale details in epoxy. In making the decision to com­bine our efforts, it was decided that fiberglass would more closely represent the original plywood mold construction than conventional balsa planking over formers. My contribution was to do the scaling, drawing, and inking as well as to design the construction characteristic to fiberglass and polystyrene foam. Fiberglass wheel pants come with the fuselages too and are quite durable. Note plywood fill-in between inner landing gear struts. Cowl alignment jig taped in place. Below: Fiberglass cowl has tabs epoxied inside for attachment to firewall. The model can be flown in Super­Scale or in Stand-off Scale contests. The Sirius does not have either retractable landing gear or flaps, thus giving other models a slight advantage in regular AMA or FAI contests. However' its ability to perform contest stunt maneuvers does tend to be equalizing. Almost every author attests to his model's ability to fly on a string. A de­tailed description of the first few flights will follow later in the text. In building the fuselage, a Dremel tool IS used to cut out the cockpit openings and the openings for the horizontal stabilizer of the fuselage. The tail cone should be cut off using the minimum cerf. When fitting the stab, it will be necessary to file the opening slightly. The fuselage tail cone will be epoxied back after the stab is installed. Mount the radial engine mount using blind nuts. Note that dimples indicate the centerline. Do not tap the mount for the engine until the engine is positioned at 0 degrees side thrust and 0 degrees down thrust. A propeller was used to assist in the measurement. Measure the drawing to see how far the thrust washer protrudes past the cowl. Don't forget the spinner back plate. Construct the plywood brackets that hold the cowl to the fuselage. Use an extra strong ep'0xy such as 3-M Structural Adhesive. With an alignment jig position the cowl while allowing the epoxy to set. After the brackets have been attach­ed to the cowl, fuel-proof them by coat­ing with Hobbypoxy II glue. The bat­tery and fuel tank location worked out well on my model. Cut out two windshields using the patterns. A strong material can be obtained by removing the copper from a thin fiberglass circuit board .030 inches thick for the windshield frames. Several jigsaw blades will be dulled cutting them out. Epoxy them in place with the 3-M epoxy. A wet finger will form a fillet nicely. Set the fuselage aside and return to it after completing the rudder, elevator and stab. Shape the ribs of 'the horizontal stabilizer as shown. When applying the sheeting, be cautious not to apply a warp. Fit the completed stab into the fuselage by filing the fiberglass and sanding the wood. Select soft balsa for the elevators and shape with a razor plane. Install the horn and hinges matching them to the stab. Epoxy the stab in place. Install the elevator Gold-N-Rod at this time. A music wire through nylon tubing will possibly be less prone to change trim due to heat (if you are worried .about that sort of thing). Construct the rudder using the same techniques as for the elevator. After hinging the rudder to the fin and installing the Gold-N-Rod, epoxy the tail cone back on to the fuselage. A good filler for the joint is common body-fender fiberglass epoxy. It can be carved in the leather stage and sanded when hard. Complete the basic construction of the fuselage including the tail skid, servo tray, hardwood wing hold-down blocks, and servo installation. Use Hobbypoxy II glue to secure parts to the epoxy fuselage. Micro balloons or Cavasill may be added to the glue when a thicker consistency is required. Cut the three sections of the wing using the airfoils that are shown on the drawing. Deduct the skin thickness when making the templates for the hot wire cutter. Wrap a two-in. wide piece of four oz. glass cloth around the sheeted wing for a dihedral brace. Push the cloth against the wood with a roll of toilet paper absorbing excess resin from the glass cloth. Feather the edges with garnet paper. Prior to the sheeting, install the aileron horns and linkage system. The aileron movement should be not more than 3/8" up and 3/8" down. When making balsa wing skins use resin to join together the skin sheets. A thin strip of silkspan doped over the inner joint will prevent its raising after painting. Use a good contact cement for joining the skin to the polystyrene foam. 3-M No. 77 is very good, but be careful to allow the thinners to evaporate before attaching the skin or foam will melt a bit. The hardwood landing gear blocks worked very satisfactorily, but the plywood plate backing the shock absorber pivot failed to support rough landings. A proposed modification will be to insert a piece of No. G-Pad under the pivot to absorb the shock override. In general, the wing is straightforward foam-balsa construction. Landing gear - The aluminum brackets can easily be cut from bar stock with a hack saw. With a power drill and file, the bracket is completed in short time. Bend the 3/16" and 5/32" dia. music wire landing gears to exactly match the drawing (see front view for front strut). The fiberglass wheel pants were not available for the prototype, therefore the first set was formed from balsa. Three pieces of wood were sandwiched and carved to shape. Plywood bearings were used for the axles. Epoxy Gel-Cote, unlike polyester, does seem to have a few pinholes. After cleansing the fuselage with acetone, spray the exterior with Dupont grey primer. Mix a small amount of epoxy body filler and push through the holes from the inside of the fuselage with your finger. After it hardens, sand with 280 wet and dry sandpaper. Small holes may be filled from the exterior with thick primer available from the auto parts stores. It may be necessary to reo peat this procedure until all the holes are filled. Surprising as it may seem, all the wooden surfaces are covered with fiber-glass cloth and resin. This is an exceptionally light finishing method if done properly. Purchase the following materials: K&B 1/2 oz. glass cloth, Francis Products surfacing resin, single-edge razor blades, a roll of toilet tissue. Cut a piece of the cloth slightly larger than the surface to be covered. Using a stiff brush, apply the resin over the cloth on the balsa surface. Roll out the toilet tissue over the cloth absorbing the resin. Tear off the end and peel the saturated paper away from the glass cloth. Be careful not to pull the cloth away from the wood. Trim the cloth after the resin has hardened, sand slightly, and apply another full coat of surfacing resin. After the resin has dried, scrape the sur­face with a sinqle-edqe razor blade as far as possible without going through the cloth. Slightly sand the surface with varying degrees of garnet sandpaper. A coat of auto primer will show any de­fects to be filled. The drawing shows the CG at 25%, although 32% is satisfactory. With the short nose moment, the difference re­quired approximately six more ounces of lead in the nose. My model used about 14 oz. of lead mounted under the engine mount and in the cowl. The Williams Bros. dummy engine was cut up so badly that the weight was negligible. Hobbypoxy was used to paint the model, The wing, rudder, fin, stab, and elevators were orange while the fuselage, cowl, wheel pants and fairings were black. Lindbergh's plane had gold trim on the cowl and fuselage bordered with red pin striping. Gold dope can be sprayed over the Hobbypoxy if the spray is mist-like. A heavy coat will cause the Hobbypoxy to blister and peel. Be very careful in removing the tape from the fuselage, as there is a ten­dency to peel the paint away from the epoxy fuselage. This can turn a mild tempered modeler irate, raving and swearing. The first flying attempt was a dis­aster followed by many successful, pleasing flights. Dr. Les Stephenson, Ralph Young and I decided to give the Sirius its maiden flight at the Hollister airport. A warm 102 degree day was chosen for the test. The Enya II engine and Perry carburetor performed flaw­lessly, idling at 2700 rpm for as long as required. The tail picked up with the first burst of power and the model made a sudden turn. to the left. The correction with my left thumb must have accidentally applied elevator and it cartwheeled. The nylon bolts sheared from the cowl mounts and the wing tips were scuffed. Other than a few small cracks, the damage was minor. Two adjustments were made. The elevator throw was decreased and full right rudder trim was used for takeoff. Once airborne, the trim was removed. This countered the torque, although there was a tendency to steer to the right. The next five flights were made at the '72 Chicago Nats. where it flew even better than I had expected. The roll is slow and in loop it tracked perfectly. The landings were easy to control which is probably due to the thick Clark Y airfoil. 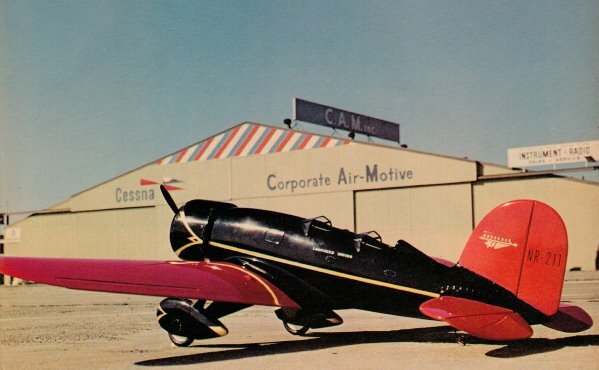 The Gold-N-Rods tended to change trim in the black fuselage when the temperature rose. The next model will probably have music wire running through the nylon tubing. When the. engine was "honking," I found the nine-lb. wonder did not perform at at all like a heavy model. It was an easy, fun to fly model. The director of the airshow, at the '72 Nats, asked me to fly it for the spectators. Many of the people showed their admiration by thanking me for taking part in the exhibition. This was personally very re­warding. After taking a dozen orders for the kit, I realized that this vintage aircraft model left a little nostalgia with the spectators. My time has been well spent. The modeler wishing to purchase the fuselage may send an inquiry to Bob Palmer, 9161 Morehart Ave., Arleta, Calif. 91331.